I've always found this building, Castel Sant'Angelo, fascinating, as it is unlike anything else from the Imperial Period. It was originally Hadrian's Mausoleum (according to some it originally had trees on top); the ashes of succeeding emperors were also placed here, up to Emperor Caracalla in 217AD. You can still visit the cavernous inner chamber, but it's quite bland now. On the other hand, the view of Rome from the top is fabulous. 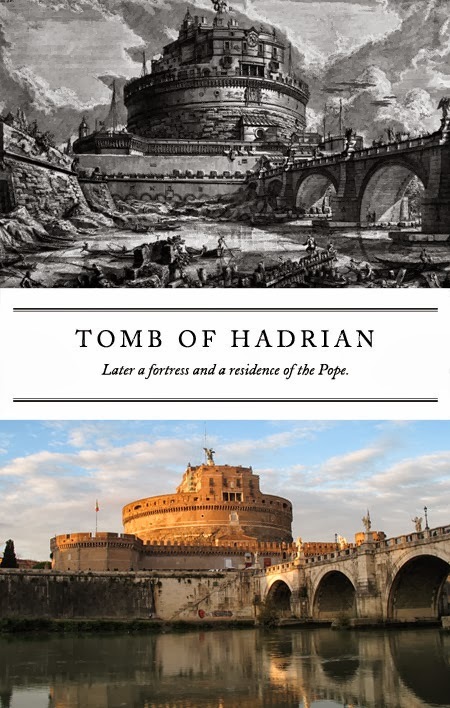 The building squats just off the river Tiber, and the bridge Hadrian built to reach it, the Pons Aelius, still stands. It was converted into a fortress in 410, incorporated into Rome's fortified walls, and stripped of statues and decorations. Later it became a castle under the popes, and was the refuge of Pope Clement VII during the Sack of Rome in 1527.